Sou Fujimoto is a leading Japanese architect, who has revolutionized architecture with his innovative and modernistic designs of residential and institutional projects, which have brought forward a new-fangled collaboration of architectural space and the human body. 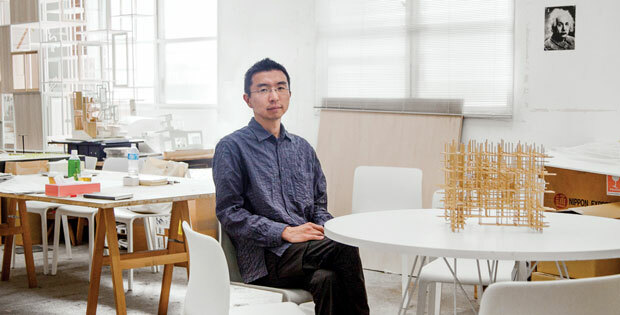 Sou Fujimoto was born on August 4, 1971, on the northern Japanese island of Hokkaida. Growing up on the island, Sou developed a love of nature, and enjoyed conducting long and leisurely explorations into the wooded landscape of the island all by himself. Most of his later work is also inspired by his love for nature, he has taken inspiration from forests and caves to invoke the aspect of natural space into his designs. He attended the University of Tokyo, and in 1994, he graduated with a degree in architecture. In 2000, Fujimoto established an eponymous firm by the name, Sou Fujimoto Architects, in Tokyo. Sou intended to design a deconstructed space where function was determined according to natural human need, and he took his inspiration from the caves on his native island. He termed this concept as the “Primitive future”, and it was demonstrated in his “Final Wooden House”, constructed in 2008, in Kumamoto, Japan. The house was constructed with large cedar beams, which were stacked like blocks. The structure of the house allowed its occupants to use the space according to their needs and behavior, and encouraged them to indulge in the unconventional use of surfaces walls, floors or sitting areas according to their choice. Fujimoto has elaborated and explained the concept of primitive future in his book, “Sōsuke genshotekina mirai no kenchiku” (Sou Fujimoto: Primitive Future), published in 2008. The same year, he also completed a residential structure, House N, in Oita, Japan. Fujimoto’s architecture obscured the differences between the artificial and nature environment, and his contemporary designs of more intimate living places encapsulated within one another dimmed the borders between domestic space and the street. His designs revolved around a concrete outer shell, with large unglazed windows, comprising of two interior boxes to provide privacy, and an outdoor natural space with trees, a garden and a wooden patio to connect the residents with the nature. Sou Fujimoto has undertaken several institutional projects such as the Musashino Art University Museum and Library in Tokyo, constructed in 2010. The library offered public space in its walls of bookshelves which resembled gigantic spirals. In 2013, Fujimoto was commissioned to design a temporary structure for the Serpentine Gallery Pavilion in Kensington Gardens, London. Fujimoto developed an ethereal, semi-transparent grid consisting of white steel tubes that connected with the landscape, and made a cloudlike and formal presentation with its multi-tiered surface that encouraged public interaction and movement. He teaches at the universities in Tokyo, Kyoto and Minato Universities. He also travels extensively to deliver lectures and seminars. His recent lecture, delivered at the Architectural League of New York in 2014, titled “Between Nature and Architecture” provided a comprehensive insight into his theories of organic and natural structures such as cave and forests, and the luxury of a natural living space which Fujimoto describes as an “ambiguous interpretation of spaces and forms”. Sou Fujimoto has been the recipient of numerous awards and accolades for his creative and innovative designs, including the 2008 Japanese Institute of Architecture Grand Prize, the 2007 Kenneth F. Brown Architecture Design Award, “Grand Prize” in the AR Awards of 2006, “Gold Prize” in House Competition by Tokyo Society of Architects and Building Engineers 2006, “1st Prize” in Wooden House Competition in Kumamoto, 2005, “1st Prize” in International Design Competition for the Environment Art Forum for Annaka and the JIA New Face Award 2004 among many others.